We went on a trip. I'm not calling it a "vacation," because when you are even a part-time SAHM, in my book you are only on vacation if there are no children on it with you. Sorry. Our trip took us to three cities in eight days, with three children under 8. There has got to be a story problem in there somewhere. Yes, I now realize that this was a bit overambitious. Not so much because of the number of children involved -- mostly because of the number of car seats. But considering that, it went smashingly. We met three babies of friends that we had never met before, I mean we had never met the babies, obviously we had met the friends because they were not those Internet "friends" who you have never met before, but real life friend friends. You know. One of those "babies" was 3 years old so obviously it had been too long since we got together with our West Coast friends. All the babies were much better looking, smarter and more charming than your average baby, because that is the kind of gene pool we swim in. We stayed in the homes of two of our wonderful, generous friends, and I hope those friends will agree that our kids were reasonably well behaved there. We also slept on an Amtrak train, in a sleeping compartment, which the kids loved. I would have loved sleeping in there if I could have slept -- unfortunately Toth was very restless and he kept Epu and I awake for much of the night. Then there was the little incident where our train ran somebody over. Fortunately, the kids didn't hear the details of our 5-hour delay, and really, Eugene, Ore., is not such a bad place to be stuck on a sunny afternoon/warm evening. Really, the worst part of the whole event (for us, not for the "trespasser" who was hit) was hearing the new conductor saying on the speaker the next day, "Let this be a lesson to you." Really? What lesson would that be? I'm thinking, "Stay the eff off our tracks because we will eff you up." Throughout the whole trip, what impressed me most is how much the kids enjoyed the simple things we did. 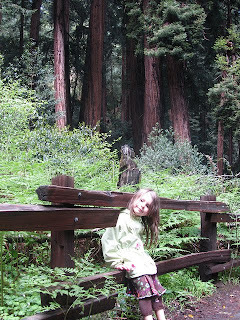 On only two days did we go anywhere that charged admission -- the Seattle Aquarium, the Seattle Children's Museum, and Muir Woods outside San Francisco. The rest of the time, we walked around, looked at waterfronts and neighborhood gardens, visited bookstores, ate in restaurants, and ran around on the beach. The girls drank in all the sites, joked around, and sang 10,000 choruses of "This Land Is Your Land." It was our first true "family vacation," and although I will definitely wait until Toth is out of his car seat -- and diapers -- before taking on another one, it filled me with dreams of more family trips to come. It did the same thing for Nutmeg, apparently. 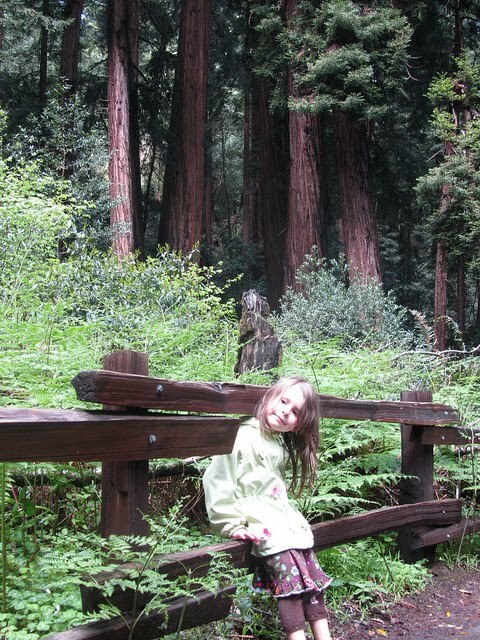 While we walked through Muir woods, marveling at the redwood trees, she asked me, out of the blue, if we would take her to Yellowstone Park someday. "You bet!" I told her. We held hands on the path and spun a plan to put a map of the United States -- or maybe the world -- up on a wall at home and mark all the places we've visited together. Now that we're home, and the daily grind has returned, the idea of purchasing the map and hanging it on the wall feels as daunting as any other little plan floating around our half-decorated house. And yet, the fact that all three of my kids held it together on our whirlwind West Coast tour, pulled their own suitcases (Nutmeg pulled hers and carried her backpack even after she threw up on the floor of O'Hare on our post-midnight return trip), and slept in four different locations over eight days? This is the light at the end of my tunnel, the beacon showing me that our kids are becoming more independent, and one day I will have a long enough break from preparingmealscleaningupfrommealschangingdiaperscombinghairnaggingtopickupyourclothes to put up that map. And even plan the trips that will fill it up.